Delaney felt lost after her cousin died. They were best friends and just five months apart. Coping with the death wasn’t easy for Delaney. She missed her cousin. They did everything together. And her family didn’t know exactly how to help their elementary-aged daughter grieve. 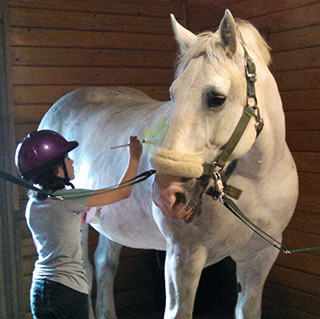 Delaney had always dreamed of riding horses with her cousin who rode at another therapeutic riding center so when the family learned of the Riding Through Grief program at Fieldstone Farm, they thought it could be exactly what they needed to help Delaney cope with the loss of her cousin. The experience has been so positive that Delaney continues to ride at Fieldstone Farm year-round despite an hour-long drive from her home in Berea. Delaney said she feels most connected to her cousin when she is riding. And the entire family has healed, watching Delaney embrace the love of horses, just as her cousin had done. At one of our horse shows, while surrounded by her parents, grandparents, aunt and uncles, Delaney demonstrated the confidence and acceptance she has learned from riding. When awarded a blue ribbon for her show performance, Delaney smiled from ear-to-ear while her family laughed and cried in joy. Horses have helped the family heal in ways they never imagined. The Riding Through Grief program is a partnership between the Hospice of the Western Reserve and Fieldstone Farm. Using the therapeutic power of our horses and the benefits of working in our tranquil farm environment, counselors and instructors work with children and their families on processing their grief. The program has been so successful that the two organizations continue to collaborate each summer.